WELL: After two years with fibromyalgia and severe back pain, Hildur Christensen was healed when she received prayer in Vennesla in 2007. 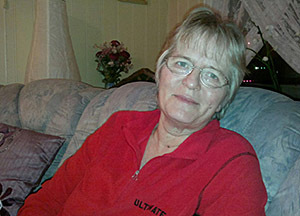 In 2005 Hildur Christensen (61) from Søndeled started feeling pain in her back. The pain moved from side to side, and constantly became more intense. She saw a doctor who examined her carefully. The result was not pleasant. She had fibromyalgia. It is a chronic rheumatic condition that causes pain in muscles and joints. In addition, one often gets tired and exhausted throughout the body. According to the Norwegian Fibromyalgia Association an estimated 150,000 Norwegians have this disease. -The doctor had no cure for the disease, but I knew that I had doctor Jesus who could help me. It was still sad to get this message. Hildur eventually started experiencing the dark side of the disease. She was in pain all day. Sometimes it was so bad that she did not know what to do. At the time there was little medication for the disease, and although she used a painkiller, it helped little. -I needed help with most of the housework. I could just forget about vacuuming and washing the floor. Fortunately I had my husband and my son who was living at home to help me. Hildur says it was a struggle carrying the laundry up from the laundry room in the basement. When she brought the laundry upstairs, she had to put down the laundry basket for each step to go upstairs. -There was very little I managed to do. Before I liked to go hiking, but there was not much of that happening now. At worst, I could sit in an easy chair in my living room with so much pain that tears rolled down my face. I was completely beside myself. In the evening I would lay in bed with intense pain. I fell asleep out of sheer exhaustion because of the pain. But as soon as I woke up, the pain was back again. All along, Hildur had faith that she could get healed. Earlier she had been healed in her wrist when she watched a Christian TV program, where the preacher prayed for the sick. Eventually she got the idea to contact Svein-Magne Pedersen. She called and had an appointment booked, and in the fall of 2007 she traveled to Vennesla. -During the prayer I felt nothing in particular, but it was good to get prayed for, she says. In the following days the back pain began to subside. Suddenly Hildur noticed that she could walk up the stairs from the laundry room in the basement without pain. -It was absolutely incredible. Eventually I was able to run up the stairs with the laundry basket without pain. Soon all the pain in the body was gone. It was fantastic! Now every once in a while I stop at the top of the stairs and think about what happened. I then start to laugh. Now I can do housework, go for walks and enjoy life without pain in my back. Three years have gone by and the pain has not come back. Jesus is great, Hildur says.